The pressure builds to plan that epic snowmobile trip. 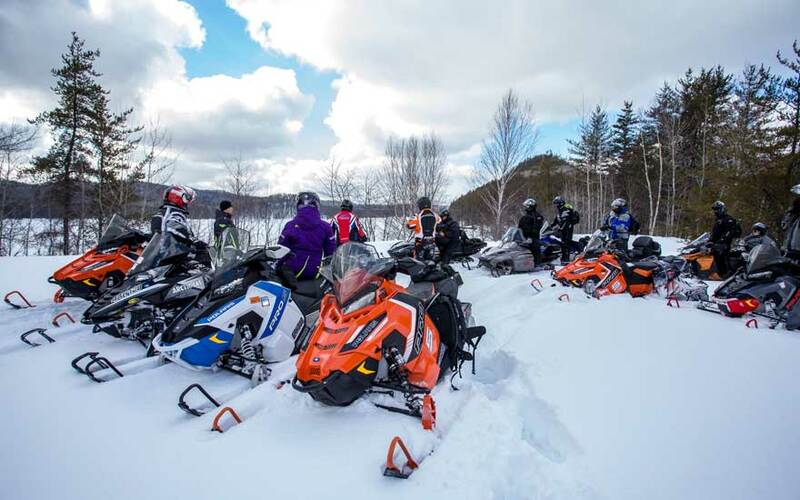 There’s a lot to arrange: which routes, number of km’s or miles, departure date, booking overnight accommodation, loading the sleds into the trailer and parking the pick-up. It’s a lot to organize but so worth it when you’re ripping up the buttery smooth trails. Algoma Country no doubt has one of the best trail systems in Ontario. 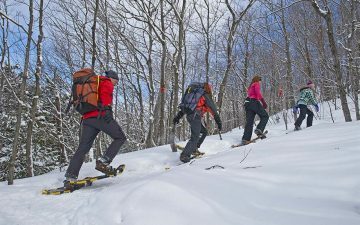 It consists of over 3,000 km (2,000 miles) of meticulously maintained trails. The incredible people who call this region home want to make a memorable experience for you. Whether at the gas station, in the parking lot, at the bar, or along the trail, the locals always stop to recommend the best places to check out. Algoma is known for its unforgettable hospitality. In the winter, these sled heads know how to make you comfortable. 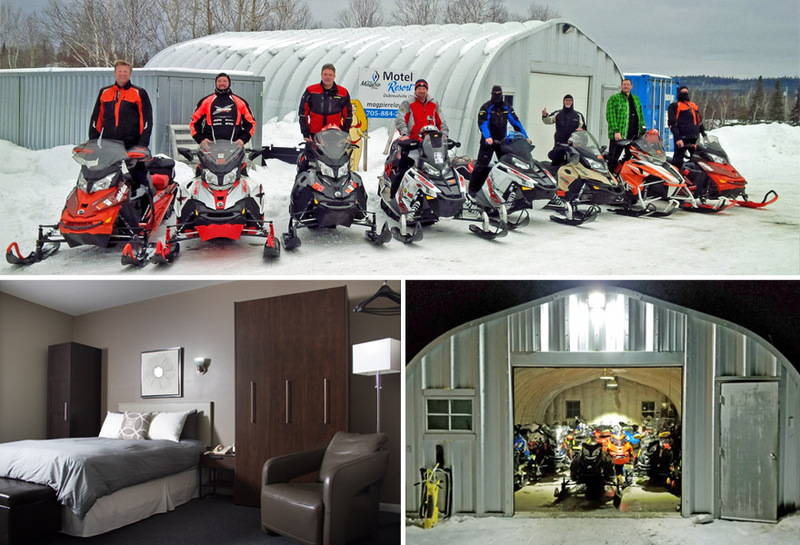 We’ve put together a list of the ultimate sled friendly businesses that will make your visit to Algoma one for the 2-stroke memory bank. Wakomata Shores Resort is one of those locations you won’t forget. It’s located on Wakomoata Lake just north of the D134 and IB6 trails. After the day of riding, you’ll have to make the tough choice of warming up in front of your cabin’s wood stove, in the outdoor hot tub or sauna. While you’re here, the Country Kitchen is the best place to fill up on home cooked meals and to tell stories. 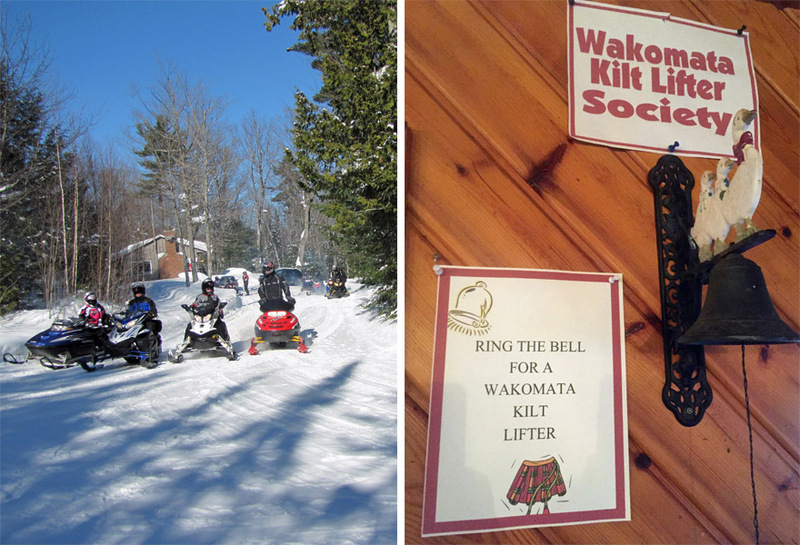 After your sled is parked and you’ve checked in for the night, order the Wakomata Shores signature Kilt-Lifter drink and watch the place go wild. We can’t say anymore…you’ll just have to ask for it. On the D Trail between Wawa, Chapleau, and Sault Ste. Marie, you will find Halfway Haven Lodge. You might think it’s a mirage but it’s completely legit especially when you can smell Sean’s famous soup bubbling on the stove. 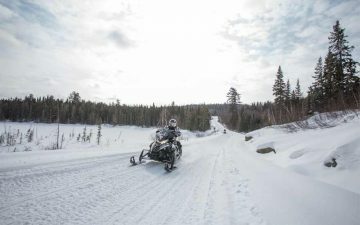 This location is vital to connecting Algoma’s snowmobile communities through the All The Way There trail. Halfway Haven captures an opportunity to break up a long day’s ride and provides good food, the area’s only fuel and a comfortable place to stay overnight. Sean, the ridiculously funny manager, is definitely someone you need to follow on Facebook for current updates, trail conditions, life pro tips, and pictures of puppies. 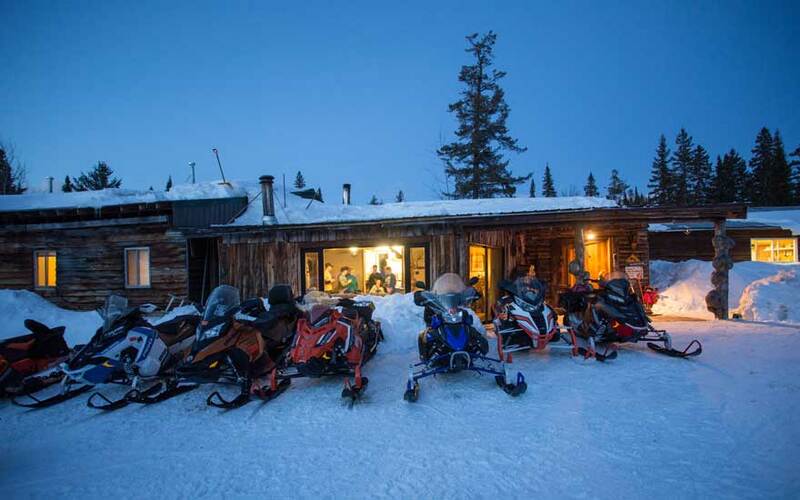 As dinner and brekky are included in your stay, it’s important to reserve your bed in the Snowmobiler’s Bush B&B. Little Wawa has an enormous heart that matches the size of their iconic Goose. 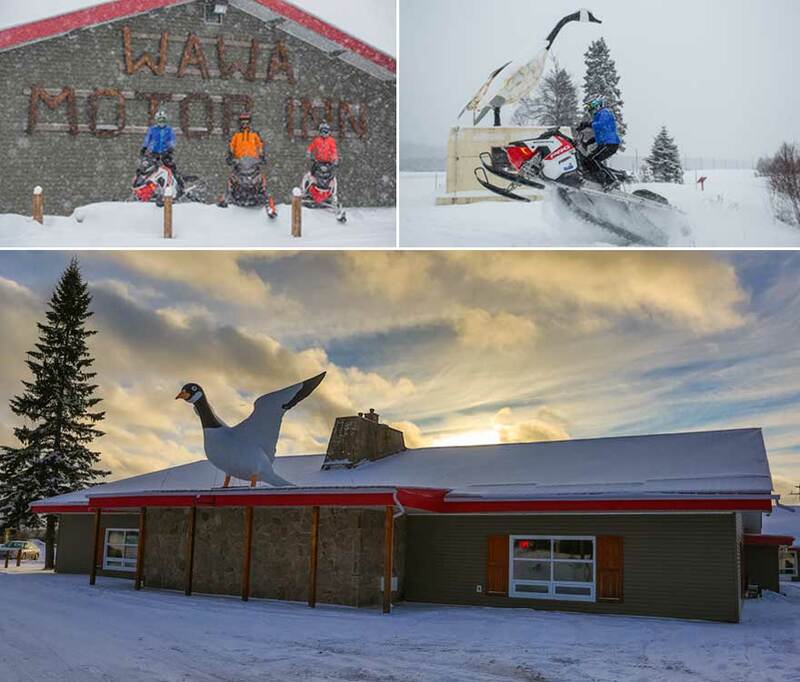 With easy access to 800 km (500 miles) of groomed trails, the Wawa Motor Inn is a great place to stage from. The first thing you’ll notice, after another huge goose, is the massive private parking lot. There’s plenty of space for your rig, convenient outdoor plugs for those brisker days and it’s close to fuel. 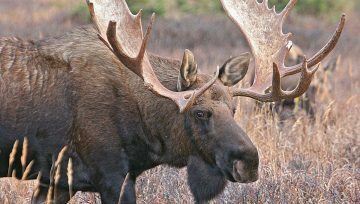 Choose between traditional motel units or, ideal for longer stays, individual rustic cabins with real wood fireplaces that sleep 4 to 8 guests. The licensed onsite dining room is well known for their 27-foot tall fireplace. In the height of sled season, this room is full of stories (some made-up) from fellow riders about their day on the trails. Owner, Pat Dubreuil, and his staff at Relais Magpie Relay are motorheads who know just what it is like clocking 250 mile days. This led them to design the ultimate sled friendly accommodation. In the heart of Dubreuilville (yes, named after Pat’s family), they’ll warm you up with northern hospitality and get you ready for the next day’s ride. Upon check-in, put your sled to bed for the night in the heated garage. A workbench is available for those who played a little too hard. Use the complimentary shuttle to head to any of the restaurants in town. The Man Cave is set up for everyone to gather round and share GoPro videos or to play a round of pool. In your room, enjoy big hooks to hang your helmet and dry your socks while you warm up in the outdoor hot tub and sauna. Add an extra day (or two) to shred the All the Way Trail to Hearst. Once you touch down in Hearst, head to the Villa Inn and Suites to chill with the cool kids. At the newly renovated Inn, there’s loads of space to warm up. This location boasts many perks; fuel located next door, free breakfast, nearby restaurants, including the last McD’s and Timmies for 500 km (300 miles) and most importantly, free Wi-Fi to upload and (surely) brag about your boss sled trip on social media. When ready to eat, no need to put your lid back on. As part of the Villa’s snowmobile package, take the free shuttle to Pizza Place Bar and Grill where you can fill up and enjoy a 60 oz. pitcher. Before you head back, explore another 250 km (150 miles) of Hearst’s local loops. Chris rides motorized things to find bakeries and butcher shops. Official SnoScoot Ambassador, and avid promoter/developer of motorsports destinations and culture.